This is one of my all time favorite. I am not an expert in making samosas. My MIL makes very good samosas. I tried making some yesterday. It was not in triangle shape (!) but the taste was good. 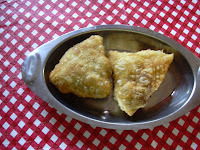 Here is the recipe I followed to make samosas. First mix maida, baking soda, a pinch of salt thoroughly and add water little by little, kneading into the pilable dough. cover it and keep it aside for 10 to 20 mts. In the mean time, take a pan, pre heat a tsp of oil, add the cumin seeds and when it crackles, add onion, green chillies and green peas and saute' for 5 mts. Now add the mashed potatoes, add turmeric powder, garam masala powder and salt and mix everything well. If necessary, sprinkle a handfull of water and mix it again. When everything is fully mixed, remove it from the stove and let it cool. This is the filling. 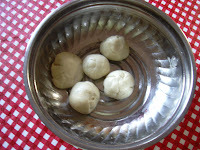 Make a small balls out of the dough and spread it into a circle of 6" diameter. Cut it into two halves. Moisten the edges with a little bit of water. Join both the edges and make it a small cone. Now add a tbsp of masala filling and close the third side of the cone. Pre heat oil and fry 4 or 5 samosas to golden brown. 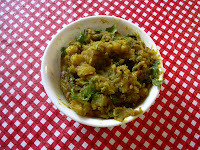 Serve it hot with green chutney and tamarind (dates) chutney. the recipe sounds interesting..btw did you mean the blog title to be "my receipes" or is it a typo? This sounds realy good. Have you ever considered taking pictures? I think that would make it even better.